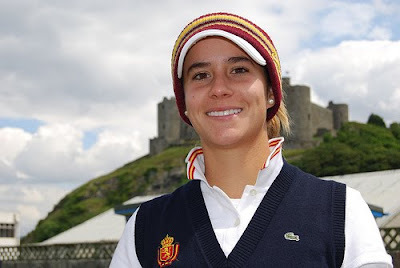 We've noted before that Azahara Munoz is a young golfer to watch. The 2008 NCAA champ and 2009 British Ladies Amateur champ completed an All-American (and All-Academic) career at Arizona State earlier this year. One of her teammates for a couple seasons was Anna Nordqvist. On Sunday, the two did battle down the stretch at the LET Madrid Ladies Masters. Munoz was making her professional debut in her home country. Nordqvist is a rookie, but this year won a major and played in the Solheim Cup. And Nordqvist threw a 63 on the board Sunday, rocketing up the leaderboard. Only to be pipped by Munoz, who shot 64. Munoz made it through sectional qualifying for LPGA Q-School last month, and will play the Q-School finals in December.